Going to the beach, or really any sort of day trip, is always enhanced by a good book. I can just imagine sitting by the seaside, sand in my toes and an amazing story in my hands. Perhaps some people might not think so far ahead as to procure such a device, so Matali Crasset of Istres, France has solved this problem once and for all. While beaches are lined with tiny stands selling frozen treats and colourful water toys, why not add one more product to the mix? 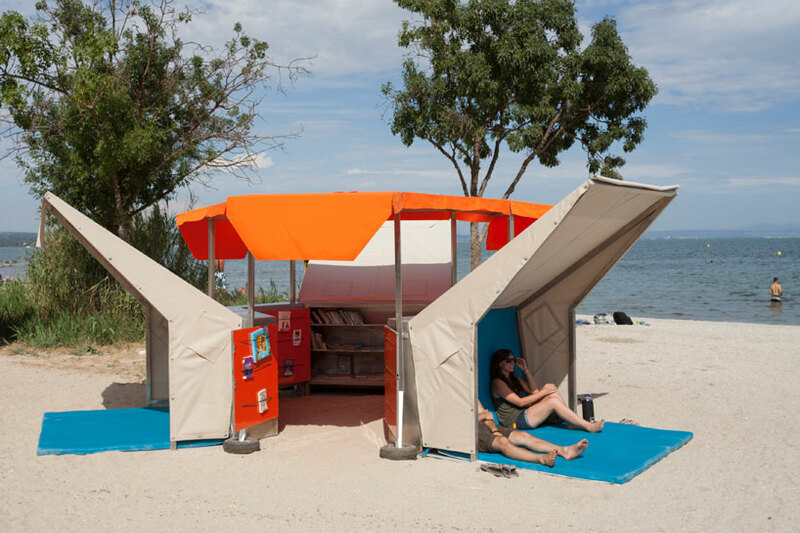 Crasset has developed a mobile beach library where visitors can sit under canopies and read a story of their choosing, all but a stones-throw away from the waves. Reading is so important in daily life (at least to me) and it can be quite a challenge to fit in your reading time. I remember in elementary school, we would be allotted twenty minutes of reading time per day. It was called something like D.E.A.R., "Drop Everything And Read". You might be surprised at the amount of creativity your brain can produce while you are reading a story. Most obviously, you are creating images in your mind about what the characters and setting look like. It also goes further than that; you are accessing the part of your brain that can create the most wonderful things. It might benefit you to take a moment out of your day and do nothing but read. Wouldn't it be great if these mobile libraries began to appear in city centres? What if they existed in urban parks as well? Businesspeople could take their lunch break to sit in these structures and read a good story for an hour (or however long lunch-hours are now).